Markus Stauss is a jazz and rock musician (saxophone player) from Switzerland, who has combined jazz with just about any musical genre imaginable and is still coming up with fresh ideas. His best known projects are probably Uberfall, Spaltklang and Ulterior Lux. He took a few "minutes" away from his busy schedule to talk with us about the new Spaltklang album, In Between and future plans. Spaltklang is back with a new album and an almost new line-up, except the drummer. Can you shed some light on the line-up changes? Yes, let me look back a little into 2001. Then I had the idea to re-arrange some of my compositions that I wrote from 1984 to 1998 among others for ÜBERFALL, ULTERIOR LUX and STAUSS - ANLIKER - KAYSER- VOGT for a new group. So SPALTKLANG with Olivier Vogt (viola), Stephan Brunner (electric bass), Rémy Sträuli (drums, synthesizer) and myself ( tenor, soprano sax) was born. The new arrangements modified some pieces massively, so that they were very different from the original versions and sounded as new compositions. Completely new compositions, however, were only the piece ALPENGLÜHEN and three miniature-pieces (1 min each). You may hear all new and rearranged tunes on the first two SPALTKLANG CDs "Alpenglühen" (2002) and "Surprise" (2004). After "Surprise" I pursued the idea to write only new compositions for SPALTKLANG. These were published on the CD "Lontano" (2006). The more new pieces I wrote then, the more I felt that the moment would come, in which a quartet would be a too small a band to realize my latest compositions. Soon after the release of the CD "en suite" (2009) I began to think concretely about enlarging the line-up in order to be able to continue playing the new songs with SPALTKLANG. My plans for expansion collided first with unexpected "events", then, to my great surprise, the finally formed 6-tet came incredibly slowly ahead, so that an intensification of rehearsals would become necessary. Unfortunately, I had to realize that this was unrealistic because of the different availability of the individual musicians. I saw no other solution than to dissolve the sextet. I don’t want to take this opportunity to warm up the tedious and depressing stories in detail, which encouraged me in my decision. Then I took a time out to think about it, whether the final end of SPALTKLANG had come or whether I should venture a new beginning. The new beginning started in January 2013 in Milan, Basel and Zurich with the quintet, which can be heard on the CD "in between". Was this one of the reasons it took 4 years since the last Spaltklang release? Yes, of course: I should have reacted differently to the aforementioned unexpected events and respond more quickly to the sluggish progress. So a year, at least, was wasted. The new line-up also includes Francesco Zago, who you have been working with on various other projects. He lives in Italy. What does that mean for potential Spaltklang live shows? Earlier I experienced similar situations: ULTERIOR LUX had a bass player from Vermont (USA) and TZGIV was most part a Belgian band. Although Francesco Zago lives in Milan, but Richard Koch lives even further away in Berlin and Christian Weber is a world-wide demand bassist who travels a lot. Although Rémy Sträuli lives right around the corner, but he also is very booked up. It would be more complicated than usual, that was clear, but I knew that it would be exactly these musicians who breathe new life into SPALTKLANG again. We will see what the future brings us. You have a new album out, called In Between. Does the change in line-up influence the sound and even your style of composing? It certainly influenced the sound: a quartet with viola, sax, electric bass and drums (with an occasional synth) sounds different than a quintet with trumpet, sax, electric guitar, bass and drums. The changed line-up has no influence on my writing style, but a bigger crew offers more options for tone color variations, polyphony, polyrhythm, patterns, etc. The music is richer in variants and this diversity brings my intentions to better advantage. I arrange my compositions always for the participating musicians to give their special qualities room. This quintet consists of fantastic improvisers, exactly what I wanted for SPALTKLANG: improvisatory richness in harmony with my compositions. Of course I know that improvisation still does not get the recognition as an art form, which it deserves. The composition as reproducible sound phenomenon, has a recall value which provides security, while improvisation is adventure. SPALTKLANG is both: "an adventure with security". The compositions are all yours on In Between. Were you ever tempted to collaborate on a piece with someone like Zago? This is certainly an interesting and obvious idea, since I have been playing together with Francesco Zago for almost 9 years. But our compositional styles are very different. Many of his pieces contain little or no improvisation, while in all my pieces improvisation always plays an important role. Or in other words: Francesco is a contemporary composer who loves rock sound very much, while I have my musical roots in a time in which improvisation in rock music was common and there were no barriers between rock and jazz musicians. Our collaboration takes place in our duo ZAUSS: here we are the creators of our common music, pieces of music all freely improvised. After a long time, you also worked with Pit Kayser (Überfall)? How did that happen? Do you still keep in touch? We see each other almost every day, because we have been living for some time in the same house. During mixing the recordings I noticed that some arrangements in "A Suite" would sound better with more than five instruments and then I had the idea that it would be wonderful to have Pit Kayser as a guest on this album. So, I asked him if he would like to contribute his hot synth playing. He agreed and we recorded his contribution as an overdub. Normally I am a vehement opponent of overdubs and the last substantial overdub on one of my albums happened about 13 years ago. It is 12 measures long, and can be found on the album "Echoes" by SAKV. But this time I just couldn’t resist, because the opportunity to hear Pit Kayser on this album with two of his great sounds made me forget my principles. Can you tell us something about the compositions? How did they happen? 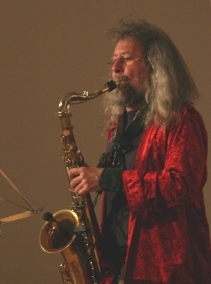 Improvising with my main instrument the tenor sax, I let the music flow in many directions. This way I find patterns, scales, melodies, short riffs, ideas how to structure tunes, improvisation concepts etc. I write down what sounds interesting to me and evaluate it by improvising again and some of the material gets enlarged, e.g. a little riff could become a real melody. It's a long process until a new tune is born and some written fragments wait for years until, all of a sudden, things move forwards. This time my emphases was to give much importance on developing the material, which means every tune is developed out of a small central motif or a short main melody. Some of these main melodies appear only a few times in its original form. The majority of the tunes consist of developed (written) material and improvisations following instructions, which are based on the central motif / main melody as well. Another feature was to work with the flow and change of energies in different ways more than ever before. The result is this collection of 5 quite long pieces you may hear on "in between". In "4 Elements" the approach is slightly different. This is a suite built out of 4 elements: a riff of 2 measures, a melody of 4 measures, a tone row and another riff of two measures. All 4 elements appear in a very archaic state only and it's the way how the musicians improvise with the material that give life to the tune. Funny, this tune is mostly improvised, with very few written lines, but it gets a lot of positive reaction especially from the Prog Rock fans. Did you want to have a heavier sound than your previous releases? Is that why you included electric guitar and trumpet (instead of viola)? One thing I must say straight away: It was never about electric guitar and trumpet instead of viola! The failed sextet consisted of viola, electric guitar, and trumpet. After, as already described, I disbanded this sextet, SPALTKLANG was on hold with the possibilities of a final end or a new beginning. Let me expressly declare that I have requested the music personalities who play now in the band, these musicians, of which I was convinced that they will breathe new life into SPALTKLANG. The instrumentation played a role in the second place. Luckily they play the instruments that are needed to make my compositions happen. Now to the question of whether I have desired a heavier sound. As already mentioned, in 2009 was the recognition that it would take a larger formation to play my new compositions. I decided to enlarge SPALTKLANG (instead of forming a new band) and only then I have made a consideration of which instruments would be appropriate. I never asked: “with or without viola?”, but I wondered what instruments can complement the existing group sound in an optimal way. Here, to bring in an electric guitar for more heaviness, was also an option, like a bass clarinet to strengthen the classic acoustic section. But exactly this instrumentation I couldn’t realize. It finally came to expand with trumpet and electric guitar, as well as a double bass as a substitute for the electric bass player who left the group. Despite the failure of the sextet I must not give up the heaviness of the electric guitar. The classic acoustic section has changed, compared to the old quartet and the sextet. Obviously, many people say the music on "in between" is now, concerning the sound, almost pure jazz. All I can say is that sound alone does not define a genre and each person who would tell a true jazz aficionado or connoisseur that SPALTKLANG "in between" is jazz, would have to expect to be laughed at. Does the name of the album, In Between, have any deeper meaning? There were also other titles to choose, but the most inspiration for the graphic artist Paolo Botta (yes, the keyboard player of YUGEN), who made the booklet design, came from "in between”. This did fit very well for me, thus "in between" became the title track: "in between" unexpected changes; from composition to improvisation to fragments; slow and fast, sudden symmetry(ies). The album wasn't released by your Fazzul label. Why did you make the switch to AltrOck? How much did the AltrOck guys help you? What does the future hold for Fazzul? Marcello Marinone (the AltrOck owner) has been a SPALTKLANG fan for a long time The first three albums "Alpenglühen", "Surprise" and "Lontano" appeared from 2002 until 2006 on Fazzul. At that time the first AltrOck CD (YUGEN " labirinto d' aqua") was not released, which means AltrOck didn’t exist. That's why Marcello and I for the first time talked about an AltrOck - Fazzul cooperation before the release of "en suite". It became finally a Fazzul production in the distribution of AltrOck. This time Marcello already signaled interest for the new SPALTKLANG Quintet right before our studio date, and we quickly came to an agreement. AltrOck has a fantastic distribution and a loyal clientele that has now discovered SPALTKLANG. We are all so happy, Marcello and the whole band. The ZAUSS duo with Francesco Zago. The 4th album is arising. This new project VOGEL (bird) STAUSS AND ITS (and his) ART GENOSSEN (companions) RICHARD KOCH (trumpet) & RÉMY STRÄULI (drums) was recorded last September. A release will follow this year. Since 2012 there is another trio called SUS with cellist Frances-Marie Uitti (http://www.uitti.org/) and the former bassist from ÜBERFALL Alex Schaub. We work on a production right now. The label on which this CD will be released is not clear yet. A part of Look For sounds like Black Sabbath's Iron Man (slightly). Was that done on purpose? Also on this topic, there's a little introduction: I am often referred to as a jazz musician, but that's not true, at least I do not feel that way. My roots are in rock music of the late 60s and early 70s of the last century, when, as before mentioned, some jazz musicians and rockers (which were then called pop musicians) were not afraid of contacting and improvising was quite naturally of big interest for both. It was not until 1973 I deeply immersed into free jazz, this free jazz that an incredible huge number of jazz musicians and fans never perceived as real jazz. On "4 Elements" you hear one in the 1st and another one in 4th Element; on "A Suite" it’s the final wamp in 7/4 played by the bass, guitar and synth; and as you heard in "Look For", there is this riff in 21/8, that may well remind you a bit of Black Sabbath. How pleased are you with the end result – the final version of the album? Maybe some concerts here and there. I have to talk with friend Marcello Marinone soon and I’ll contact some festivals. To be honest, my time is already filled up with a couple of new projects, bands and the before mentioned Fazzul releases.